For the last few months, a bizarre spectacle is being played out before the nation. From speechifying and grotesque, undignified lampooning of the political class at the Ramlila Maidan, Team Anna has now pervaded TV studios, news columns, seminars, election rallies, twitter et al to spread their disinformation campaign on the Lokpal issue. Riding the wave of popular discontent and anger with the governing class, this clever group of individuals have occupied the judgement seat on all matters relating to the Lokpal. Through a relentless barrage of half -truths and gross misrepresentation of facts, Team Anna has beguiled a largely urban constituency into believing that their Jan Lokpal Bill, if enacted into law, will bring an end to the common man’s travails. And so low is the credibility of the government that there is hardly any attempt on its part to expose the sheer hollowness and duplicity of their claims.. For that matter, Team Anna’s propaganda has been so effective that anybody criticizing the Jan Lokpal Bill is either for corruption or is a government stooge. Sophistry today rules the public space and in the bargain, the country is being taken for a ride. Instead of strengthening the democratic,parliamentary process, Team Anna is undermining it. Behind the veneer of appearing reasonable and open to debate by agreeing to joint consultations, discussions, interviews etc., it is clear that Team Anna will not agree to any change in the substantive features of the Jan Lokpal Bill. Every other formulation is judged on how closely it approximates to the Jan Lokpal Bill. The basic structure of the Bill has been decided , is non-negotiable and everybody else must fall in line. Is it any wonder then that Bal Thackeray, himself no dove, called Anna Hazare a “Taliban Gandhi”? In a completely perverse interpretation of power ultimately resting with the people, this small self-righteous group has arrogated to themselves the power to decide on the Lokpal legislation,and the elected representatives of the people are expected to toe their line. When criticized for being authoritarian in their approach, their devious but extremely effective response is to pose the rhetorical question, whether it is a crime to insist on a strong Bill to combat corruption. Every criticism is denigrated as an attempt to weaken the Lokpal and thereby the fight against corruption.Specious reasoning but it evokes prolonged applause. Team Anna’s mindset and attitude can best be described as a form of “psychic closure” which renders them incapable of learning from new experience or knowledge. The intellectual dishonesty and hypocrisy of Team Anna are also exposed in their criticism of Rahul Gandhi’s proposal for making the Lokpal a constitutional body. They have argued that his formulation is a delaying tactic as it would require an amendment to the Constitution and would, therefore, indefinitely put back enactment of the Lokpal law. However, they have not informed the nation that their Jan Lokpal Bill also requires amendment to the Constitution. To give one example, the Jan Lokpal Bill envisages a Complaints Authority which would be empowered to dismiss, remove or reduce in rank any Lokpal official for misbehavior or corruption, including CBI and CVC officials inducted into the Lokpal. However, this would be possible only if Article 311 of the Constitution is amended. The team’s deviousness is apparent from the fact that while not admitting that the Jan Lokpal Bill cannot be implemented without Constitutional amendments, Team Anna, in changes proposed to the Govt. Bill submitted to the Standing Committee, have suggested amendments to Articles 105 and 311 of the Constitution. Should not the country be apprised of their double standards? A grave and legitimate criticism of the Jan Lokpal Bill is that in trying to cover all bases, it would become a bureaucratic behemoth, a Frankenstein monster. Based on Team Anna’s formula of one Vigilance Officer for every 200 employees, the Jan Lokpal requires 30,000 officers for monitoring 4 million Central Govt. and 2 million Central Public Sector employees. Another 300 officers are required for other groups covered under Section 2 of the Prevention of Corruption Act as also the political class and judiciary. That’s not all. For grievance redressal, one or more Appellate Grievance Officers are required in each of the 627 Districts of the country, not to mention the Complaints Authority in each State and the hundreds of inquiry officers from amongst retired civil servants and judicial officers. Providing inspectoral, administrative and other support staff on the most conservative basis of six non-gazetted staff per officer, against the government’s officer to staff ratio of 1:20 would imply induction of over 1.8 lakh staff. Based on Indian Railways’ annual wage per employee of Rs 3.79 lakhs in 2010-11, the annual wage bill of the Jan Lokpal would be over Rs 8000 crores, not including the enormous infrastructure costs, whereas Team Anna ,through artful disinformation ,have deflated the financial outgo on the Jan Lokpal to a figure of less than Rs 3000 crores annually. Anna’s Team has ridiculed the criticism that it would be difficult to ensure the integrity of people in a monstrously large anti-corruption set up and has cited the example of Delhi Metro which has a workforce of 7000 officials and delivered a world class system. Anna’s Team could not have chosen a more inappropriate example to prove their point. Delhi Metro has only 5 vigilance officers on its rolls and is a truly exceptional organization on account of the most dynamic leadership seen in this country, a motivated work force, adoption of best practices , an environment of openness and trust and a tight and compact unit concentrated in one city. Mr. Sreedharan has repeatedly said that ensuring a clean administration is a critical management function, whereas the vigilance unit can only raise the storm signals. It is also a fact that in 2005, Sreedharan had warned the then CVC against too much meddling in the affairs of the Metro. When addressing public gatherings, Team Anna employs a different ruse to answer the criticism. They tell the audience that whereas the Jan Lokpal Bill seeks to include all govt. functionaries so that the voter card or passport or ration card is provided to the ordinary citizen without paying bribes, the government draft is aimed at protecting the corrupt lower functionaries by not including them within the purview of the Lok Pal. To the question of how the integrity of the Lokpal officials will be ensured, the ambiguous answer is that any Lokpal official found guilty of corruption will be dismissed within 2 months. Team Anna conveniently avoids telling their captive audience that present govt. rules also provide for stringent action against wrong doers but the crux is poor implementation. The truth is subsumed by the thunderous applause that greets their half-truths. Team Anna lives comfortably with contradictions.They have been scathing in their attacks on the government bureaucracy and yet ironically,the JanLokpal Bill proposes taking over the anti-corruption wing of the CBI along with the incumbents, as also the CVC. Moreover, only retired civil servants and retired judicial officers will qualify to be the Lokpal’s inquiry officers.Would they not sully the pristine, clean waters of the Lokpal? Team Anna are also outraged that Government has allegedly tapped their phones, but yet they want the Lokpal to be armed with the powers to tap phones at will.”Discretion in excess” was considered to be an act of corruption in an initial draft of theirs , but in its final form, the JanLokpal Bill invests the Lokpal officials with wide-ranging discretionary powers that cover recruitment, punishments,imposing penalties on any government official for failure to comply with Lokpal’s orders, however unreasonable or absurd,etc. Team Anna have become masters of the art of dissimulation. When cornered by critics regarding various provisions of the Jan Lokpal Bill, they avoid giving a proper reply by stating that the law is complicated and cannot be explained in a few minutes. And yet this team claims to have educated the masses on the nuances of the Bill, on the basis of which referendums are held which give the Jan Lokpal Bill a resounding endorsement. 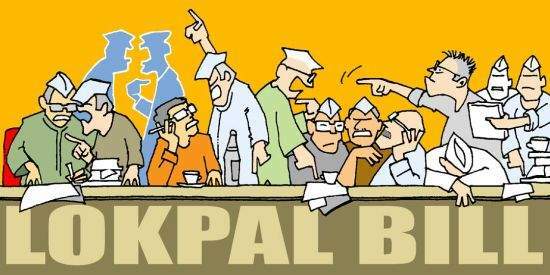 People are tricked into believing that the Jan Lokpal will bring to book all government functionaries who currently have made life for the common man a living hell. The grave infirmities in the Jan Lokpal Bill are drowned by populist, general rhetoric. Their formulation is simple: the Jan Lokpal officials, armed with supreme powers, are the knights in shining armour who will destroy the corrupt political, judicial, and bureaucratic functionaries across the board and herald a new dawn. On top of every thing else, Team Anna are also dream merchants selling fantasies to a trusting public. As with all other issues, Team Anna studiously avoids discussing the nuts and bolts of the Jan Lokpal Bill. Serious questions have been raised to which Team Anna responds with obfuscation or general observations. How will an autocratic Jan Lok pal with about 2 lakhs officials in hundreds of field units across the country function differently from a bureaucracy and how will their integrity be ensured?? What kind of training will be imparted to them ? What will be the hierarchy ? What will be the status of new recruits vis-a-vis the CBI and CVC officials inducted into the Lokpal. How will it be ensured that tyrannical powers such as phone tapping, immense punitive disciplinary powers, etc. are not misused ? How will it be ensured that gang wars and frictions between Lokpal officials and govt. law-enforcement agencies are avoided? What would be the time frame for setting up of such a massive apparatus ? Will not an overarching Lokpal with complete disciplinary powers over government officials emasculate the management and thereby result in organisational paralysis? Before the Jan Lok pal Bill is even considered for ratification, all these issues need to be spelt out thread-bare. Sermonising, politicking and scoring debating points are not the answer.